Perforations of the nasal septum occur from a variety of causes. Disease processes such as rheumatologic and granulomatosis etiologies are one common source. Unfortunately septoplasty surgery and septal cartilage harvest can be an iatrogenic source although it is not the most common. 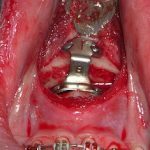 If a septal perforation occurred in a more easily accessible area, the success rate with its repair would be more predictable. 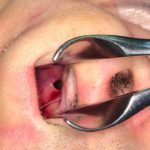 A wide variety of nasal septal perforation repair methods have been described, each with variable success rates. In an Online First original investigation in April 2019 issue of JAMA Facial Plastic Surgery, a paper entitled ‘Outcomes of Nasal Septal Perforation Repair Using Combined Temporoparietal Fascia Graft and Polydioxanone Plate Construct’ was published. 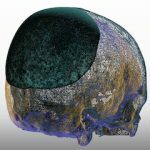 In this multi-study center clinical study, the authors report on their experience using this combined alloplastic-graft composite for providing internal coverage underneath a septal perforation. A total of seventeen (17) patients were treated over a three year period. The causes of the perforations seen were iatrogenic (9) rheumatologic (2), and unknown causes. (6) The most common symptoms were nasal crusting, a whistling deformity and nasal obstruction. Average perforation size was around 1cm. The majority of the patients (15out of 17) had complete closure of their perforation at 6 months after surgery. Septal perforations of 1cm in diameter are not easy to get a successful repair. So a near 90% success rate with any technique is noteworthy. What is unique about this method is that a reservable polymer material serves as the carrier/backing for the fascial graft. It is presumed that the backing holds the graft in place so it becomes revascularized and grown over with adjacent mucosa which happens long before the PDS plate breaks down and resorbs six to none months later. PDS plates are an interesting and logical choice of a polymer backing for the graft as they have a long history of use in the nose as cartilage shaping suture. It is the only restorable suture of any strength that I have used in the nose that has never caused any inflammatory or reactive suture problems.